K2 Space managing director Mark Phillips argues that social space is the most important part of today’s modern office in the latest issue of FM World magazine. Breakout areas and office kitchens are good for helping employees engage and share ideas more readily, with people often feeling more relaxed and comfortable than in more formal meeting rooms. Investment bank and asset manager William Blair has recently introduced a business lounge at its London office in Broadgate Tower. Sensible furniture choices and more domestic lighting and soft furnishings give their social space a more domestic feel. 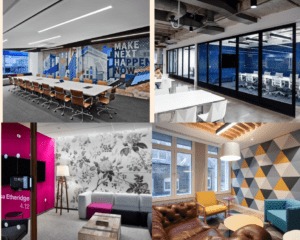 Other recent projects that included excellent social spaces include our work for Groupon in London and Adobe in Dublin. Both spaces offer a range of seating options for people while they are in the office. 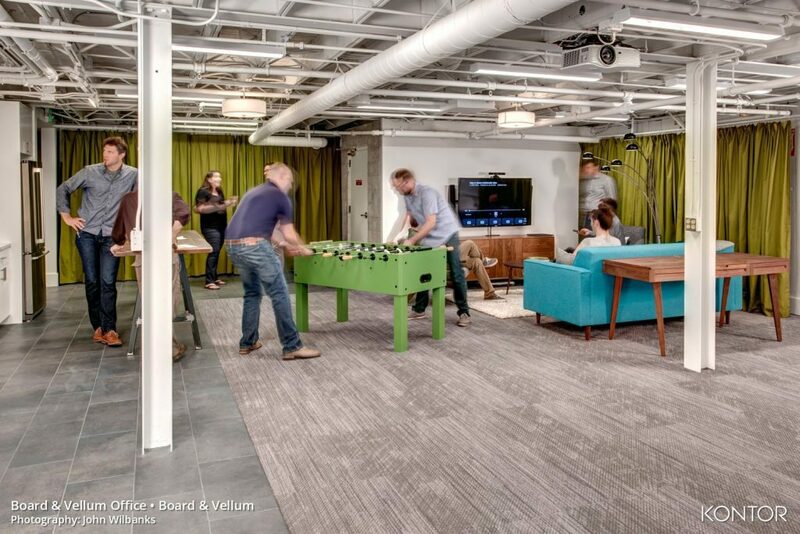 Many firms are bringing the third space into the office and providing social spaces for staff to work and play in. With today’s mobile, digital workforce often choosing to meet and exchange ideas in office kitchens and breakout areas, it is here that facilities managers can get the best from their people – where they feel physically, acoustically and intellectually comfortable. Traditionally the third space has been defined as a place between home – first space and office – second space. A good example of a third space is a coffee shop where people can comfortably work from their lap top, access the web via Wi-Fi and socialise. The social space between home and work is now brought inside the office and are generally areas between workstations and formal meeting rooms. These third spaces are often breakout areas and kitchens. There is a trend for increased spending on collaborative areas. You don’t have to look too far back – perhaps to 2000 – for a time when investment was heavily focused on workstations and client facing areas. Private offices in particular could see an FM spend in excess of £5,000 per workstation with panelled desking and bespoke storage solutions. 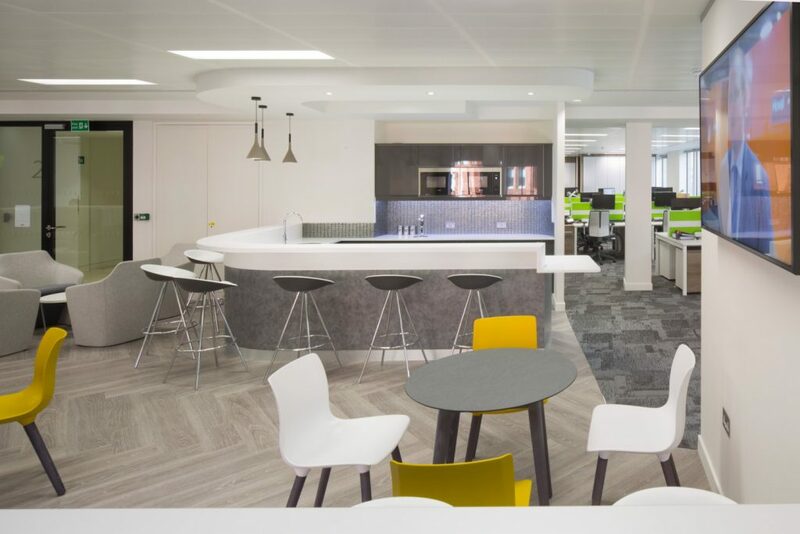 This has shifted to collaborative, breakout spaces in the modern office, with clients often increasing the footprint of the traditional office kitchen to incorporate informal tables and chairs and other facilities. The industry has gone past the point where a good social space was seen as a ‘nice to have’ as part of your office design. This kind of facility is now expected, particularly in larger workplaces. There is a sense that a communal staff kitchen can help junior people and senior management to interact more effectively. Creating a new social space in your existing office might be easier than you think. In certain industries, particularly financial services, office design is changing to fit today’s needs. Ken Harry is an architect with Abel Design Group and he told the Houston Business Journal how law firms in particular are evolving. He explains how computer literacy has had a large influence on the need for support. “Traditionally, the ratio was one secretary per lawyer. Now, we’re looking at one secretary per five or six lawyers. If a secretary takes 100 square feet – that has a huge impact on space.” Coupled with this, advances in technology mean that facilities such as libraries and archives are being moved to the cloud, freeing up areas that are ideal for being turned into social spaces. 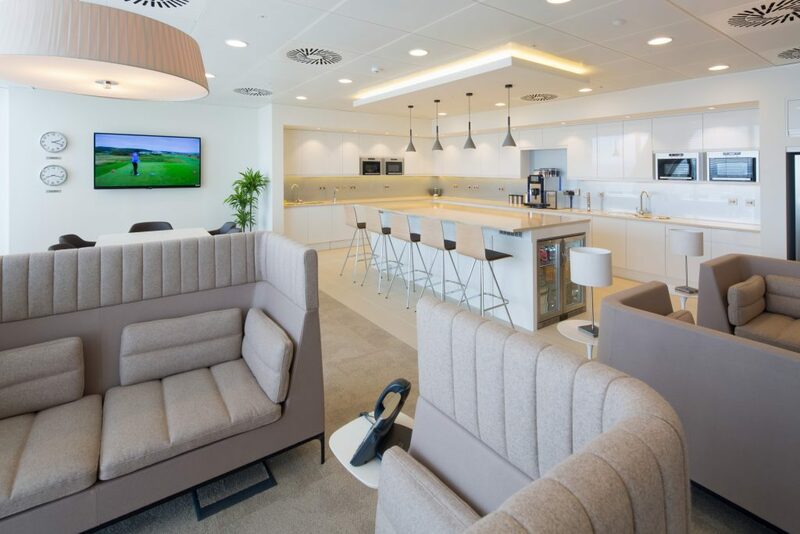 Home comforts really make a difference in corporate office fit outs. Business lounges in the workplace are also being implemented. Furniture choices like high-backed sofas, coupled with carpeted areas and drop lighting work by turning this space from an office kitchen where you just come to get a coffee to a lounge where you can exchange ideas or just relax. A good social space is incredibly flexible. Clients who think about how they work and what their people need tend to get this right. The best social spaces will be truly multi-purpose. A small space can serve as a kitchen, an eating area, informal meeting space, a hot-desk facility and a space for training, presentations and parties. 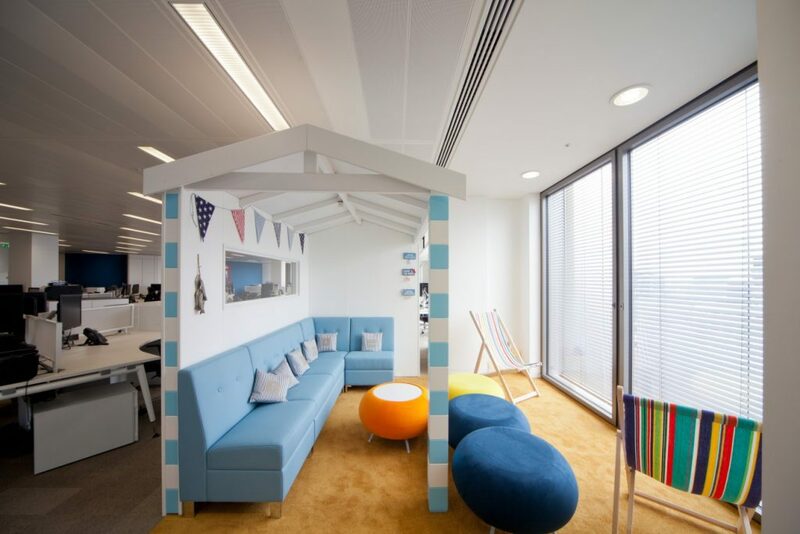 E-commerce company Groupon has recently introduced a large social space at its London office, that takes advantage of views of the Thames and Tower Bridge. The modern office space includes a kitchen with a 16-seat breakfast bar, which enables whole teams to eat together. A mix of booths, sofas, swivel lounge chairs and plastic seats also affords a choice of settings for meetings and relaxing in. Finally, staff can take a break and enjoy the air hockey and table tennis tables. Integrated technology is a must for the modern social space. A recent survey by CoreNet Global and Cushman & Wakefield has revealed that 88% of EMEA corporate real estate professionals are actively investing in workplace improvements and 95% are addressing workplace technology as part of those efforts. Security and speed of data exchange is important in the digital economy. Power and fast, reliable WiFi are the minimum requirement for social spaces. Other technologies such as Clickshare, a wireless presentation system, make it easier for your people and your clients to come into your office and work efficiently and share ideas. 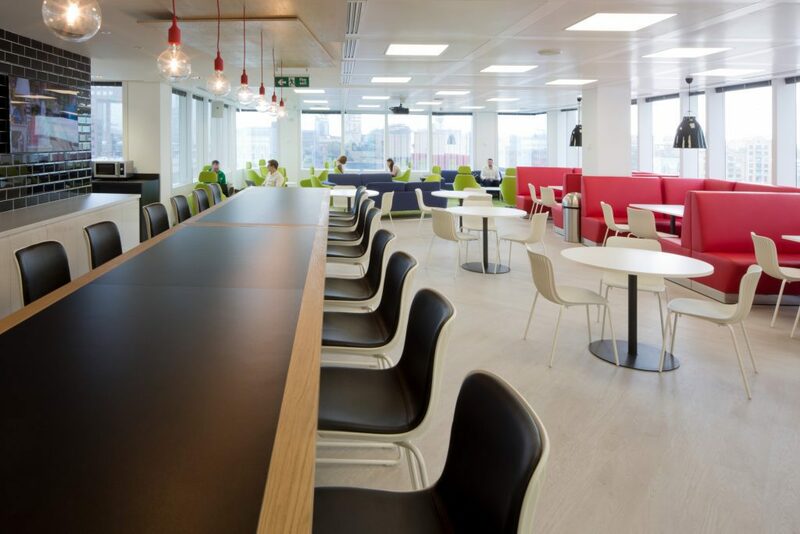 Social spaces can play an important role in solving open plan office problems. Occupiers are looking for ways to maximise the efficiency of space and create appropriate boundaries between departments. Facilities managers are starting to incorporate social spaces in the form of acoustic booths and pods. They create effective sound barriers between a team of developers and a noisy sales team. More meeting room space is high on many occupier wish lists. Increasingly, social spaces incorporate facilities that enable meetings to take place in them. With no formal booking process and coffee often on tap, people choose to meet in social spaces ahead of traditional meeting rooms and boardrooms. Certain companies will feel very comfortable with bringing their clients into these spaces, making them feel closer to their brand and making their relationship more genuine.